The Cacabey Astronomy Medresse, which is located in the center of Kirsehir, was built in 1272-1273 by Kirsehir Governor Nureddin Cibril Bin Cacabey during the period of Anatolia Seljuk Sultan Kılıç Arslan's son, II.Giyaseddin Keyhusrev. The building was used as observatory during that time. On the medresse the first striking things are the columns which were found in the outer corners. Totally three units of columns's are believed to firing and launching situations of rockets. One of the best examples of Anatolian Seljuk decorative arts and as if functioning the soul of master, giving the secret, double-colored crown gate is another striking element of the structure. Some figures on the work of crown door have been a discussion topic of today. Especially in the entrance of the crown gate the spheres which are hang down from columns headers are thought to symbolize the moon and the sun, besides comments on ''the circular shapes which are located on the right and the left lower corner of the pediment shows the equatorial line the skew of the axis'' has taken its debates to zenith. Also the verses take part from the Quran on the crown gate and it is not overlooked that window decorations in the tomb are processed by master hand with a great care. Observation Tower at a height of 21 m was build to the southwest facade of the structure and separately from the construction 22 cm. At the top of the brick-bonded observation tower zigzag decorations take part, the flat decorative on the bottom is occurred. Because of the color of turquoise tiles placed between the flat decorative, to medresse that that is used as a mosque today, it is also called ''the tiled mosque'' among people. In indoor, in the middle of the courtyard the observation wells which provides sky science surveys and light lantern is located just above it. Moreover, there have been 8 students rooms for education. At the same time, the columns which are located in the corner of the structure was formed by overlapping of the cone and sphere, the idea is widespread that they symbolizes planets in the solar system. Furthermore, Cacabey Astronomy Medresse which is standing with all the magnificence and mystery today and entrusted to us as a sacred heritage from our ancestors, the work was started for the receipt of World Astronomy Heritage List. The Medresse in which there is the mausoleum of Cacabey who left such a great work for Kirsehir and providing such value to science, has been focus of interest for many visitors today. 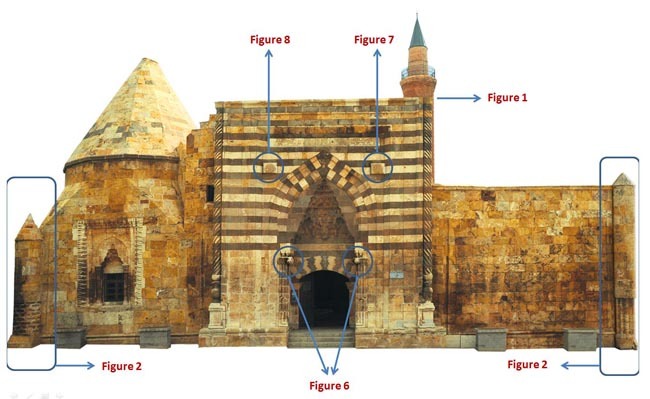 According to the inscription over the crown gate; the Cacabey Astronomy Medresse, which is located in the center of Kırşehir, was built in H. 671 / C.1272-1273 by Kırşehir Governor Nureddin Cibril Bin Cacabey during the period of Anatolia Seljuk Sultan Kılıç Arslan’s son, II. Gıyaseddin Keyhüsrev. The building was used as observatory during that time. There is a crown gate on the north facade of medresse, which is used as the entrance and reflects the special features of the Seljuk’s period. On the northeast of the building there is the dome of Cacabey that is constructed adjacent to the medresse and on the southwest of the building there is a minaret. The characteristics of Cacabey Astronomy Medresse are columns on the facades and corners. There are total three columns which show ignition and launch states of a rocket. During the XIII. century the used rocket designs in this building are important indicators of the harmony between the function and architecture. The medresse was completely made of stone and rubble stones and the minaret was made of glazed brick. The decoration of the Crown Gate for which two colourful stones were used has an important place in the Anatolian Seljuk's Decoration Art. There are two circular shapes representing the sun and moon on the Crown Gate and on the right and left side. “Besmele” and a part of (from Koran) Nahl sura’s 90. verse is written on a one-line inscription on the top of the entrance arch. Under this there is another inscription on which 18. and 19. verses of (from Koran) Âl-i İmran sura are written. Another inscription, which is placed between this writing band and the gate arch as two lines and a text is added to the right side corner of it, is an order call telling about abolishing some taxes. The niches at the both side of the entrance have an entirety with the portal. Cacabey Astronomy Medresse, which is in the group of closed courtyard medresse among Anatolia Seljuk’s Period Medresses, is composed of two rectangular shaped liwans whose shapes are close to a square. From the portal on the north; there is an entrance to the entry liwan and then to the courtyard. There is a well in the middle of the courtyard and there is a light lantern on it. It is thought that this well was built as an observation well to observe the stars. The main liwan is situated in the south of the courtyard. There are two columns on the right and left side of the main liwan. And these columns are shaped by putting the cone and globe over and over. There aren't any samples of this column preparation in the Anatolian– Turk Art. Besides; there are eight student rooms on the sides that were built for education purpose. From the liwan on the east of the courtyard; you can reach to the Nureddin Cibril bin Cacabey’s dome with seven stairs. From the right of the entry courtyard; you can go to the upper floor rooms, which are only placed behind the north facade. The square residence with a dome on the left side of the entry facade of the medresse is the dome of the Cacabey, founder of the building. It is covered by conical hat from the outside and covered by a dome from the inside, which is connected with Seljuk’s dome traditions. The entry door of the tomb is decorated with twisted branch and palm leave motives. The tomb is formed by two floors and the ground floor is the part where the real grave room is placed. An inscription band is rounding the wall inside the tomb that was written on a white ground with turquoise and dark blue colored ceramic. There are two windows on the north and east side of tomb. The window on the north side is designed as mihrab. It was written as “the world is a station and everything is mortal” on the two lined inscription under the muqarnas niche. The trunk of the 21 m height minaret, which was made of glazed brick, was decorated by turquoise colored ceramics. There is a plain decoration below the minaret and zig-zaged decoration over it. There is a pray for the builder in the inscription on the minaret. Here it was written that; “the blessing of God is asked for the founder of the building and it is believed that this wish will be accepted even before the sound reaches to the celestial”. It is thought that the minaret was used as an observation tower. It is estimated that the medresse was ruined in the XIX. Century. Indeed A.D. Mordtmann, who passed through Kırşehir in 1958, has written that the building was used as munition store that time. Later a part of the ruined building was built as a mosque and this information was written in 1325 (1907) Ankara province year book. The Medresse is still used as a mosque. Medresse, which was restorated in 2006, is used as a mosque nowadays. The Governor whom we wish God to bea ruler forever ordered to remove the Sahne tax, Tabkur tax, even the soap tax and the Guse tax. We all pray for our ruler because of his removing these taxes. God makes the one who brings these taxes again meet disaster. Besides, such taxes as the cancellation special to the ones plantig the linen have been removed.